What is Weekendinvesting all about? Weekendinvesting is a portfolio advisory using which you can run your portfolio in your own brokerage account with just 15 minutes of effort a week. Optionally you can use a smallcase too. To get more information straight in your mailbox, please click here. 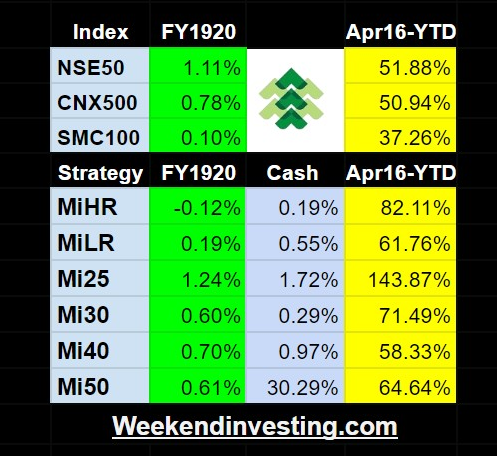 WeekendInvesting.com is a 100% mechanical momentum based SEBI Registered Investment Advisory to help you invest directly in the Indian stock markets so that you may reach your financial goals sooner without spending much time on the markets. All our strategies are genetically driven by the “Momentum” engine. The process of managing your own portfolio take under 15 minutes of your time once a week. This logical and evidence based investing is designed to be easy to implement even if you have no market experience. All strategies are DIY (Do-It-Yourself) ones. You will run your portfolio in your own broking account. You retain full control over your money and assets. A live model portfolio is shared with you at all times and ONE weekly update email is sent at a precise pre-decided time for portfolio update execution. Strategies vary based on risk profile /market cap diversification and expected Risk/Rewards. The number of stocks can range from 20 to 50 stocks in a portfolio. Allocations within each product strategy, entry and exit decisions etc are clearly and precisely defined at all times. There is no room for any ambiguity. No predictions, guessing, praying or hoping for returns. We follow market trends and good upward market trends get us premium returns. No fundamental stories to follow and no guessing the next results, the price behavior takes care of all that. Long term wealth generation is the key focus of the model. Individual stock success or failure is immaterial. The overall absolute returns is all that matters. These strategies can complement your other investments in equity related instruments such as Mutual funds, direct equity or PMS managed funds. A unique service performance guarantee is included on an annualized basis. More than a thousand investors are making use of this easy, unique and successful approach to compliment their investments. Please read some testimonials here of past and current clients.